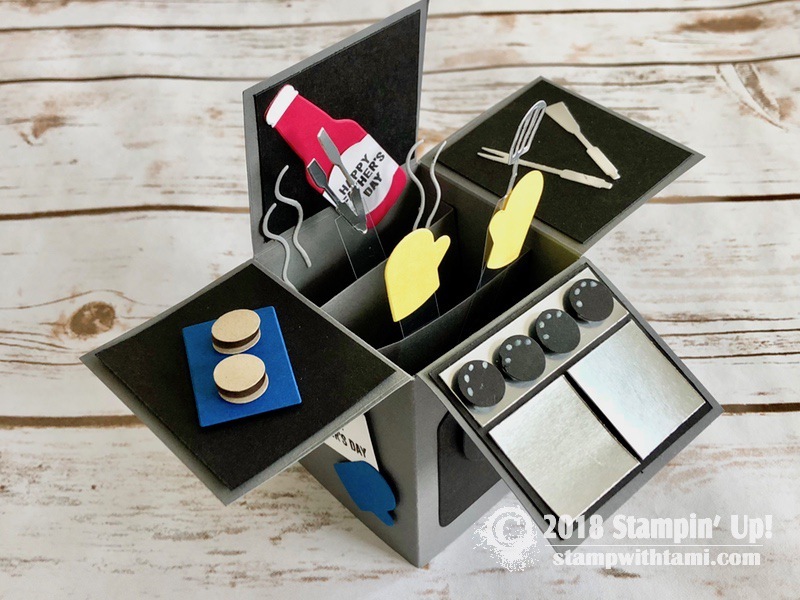 Welcome to my Stamp It Demonstrator’s Group Father’s Day Theme Blog Hop. We’re all really excited to unveil our projects, and announce a new contest give-away (below). To continue on your journey through our projects, simply use the BLOG HOPPERS links below. 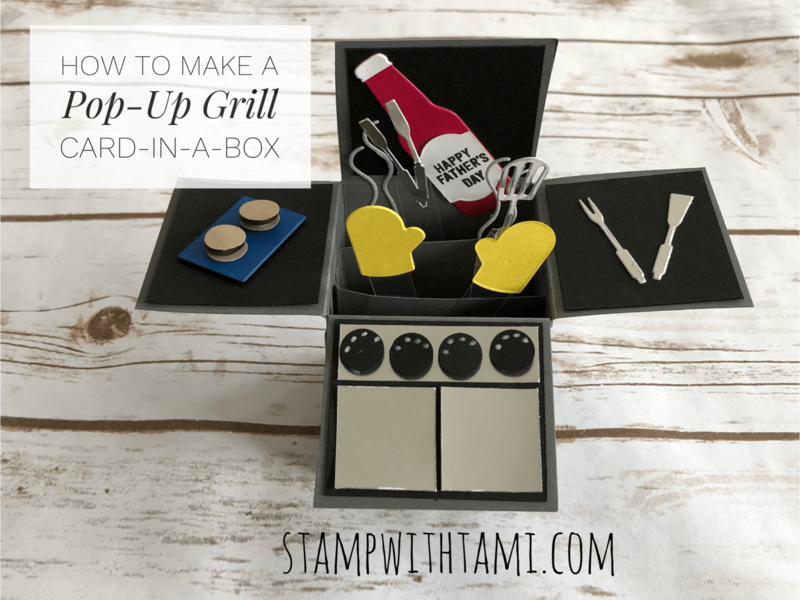 It’s a pop up grill “explosion” card-in-a-box for Father’s Day, or a birthday for your favorite griller. It’s fun and surprisingly easy to make with the Stampin Up Apron Builder and Bottles and Bubbles dies. I have a template with scoring and cutting details, and a die cut guide, with the free pdf below. 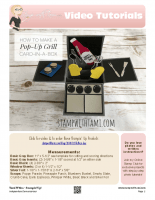 I’ll live on YouTube or Facebookat 10am EST sharing creating this set Pop Up Grill Card. Enjoy all your videos! I learn so much! Thank you! OMG…the perfect masculine card for summertime celebrations! What a wonderful Father’s Day card. Tami another WOW card- love how you can make so many fun items to put in/on your pop of card thanks for the video and pdf! #stampitcontest. This is a beautiful card. Lovely card, very unique. I think I will have to make this card. Thanks so much for the instructions. #stamp it contest Wow awesome creation Tami! #Stamp it Contest. Wow awesome creation Tami! Thanks for sharing! What a cute and clever card! I love your videos!! #stampitcontest I love the grill. #stampitcontest Loved watching you make this card. I have to make this card. Oh.my.gosh! That has to be the cutest/coolest pop-up card I’ve ever seen! #stampitcontest Thanks and God Bless! I can’t wait to try this card! Thanks! I absolutely love the Father’s Day Grill card!!! I love your energy too! Thank you for sharing! #stampitcontest I love the pop up card. I have shied away from these thinking they are too complex but you make them look easy. I can’t wait to try it. #stampitcontest I love the card . Such a novel creation! I love it! It’s a perfect card for my husband! This card couldn’t be any cuter…so adorable and fun! #stampitcontest. Would love this set! Gorgeous. #stampitcontest This Card is amazing! Love this card. I love all the little details. #stampitcontest This is the cutest set I’ve ever seen. Thanks for all your hard work Tami!